Squids In: are Jellyfish the great lost band of the 90s? Power-pop princelings Jellyfish were the new Beatles, ELO and Queen all in one – until bad vibes and psychic turmoil snatched defeat from the jaws of victory. The last time Andy Sturmer and Roger Manning spoke to each other was in the spring of 1994. They hooked up in Los Angeles to record a song for a tribute album to Harry Nilsson, the American singer-songwriter who’d once run wild with John Lennon and had died of a massive heart attack earlier that year. Having cut the track in an afternoon, the two high-school friends went their separate ways. Or, to be more accurate, Manning split for a career as a jobbing musician, while Sturmer effectively vanished. Both of them prodigiously gifted musicians and songwriters, Sturmer and Manning seemed to spark best off each other. In 1989 they formed a band to realise their shared vision of a single group capable of sounding like all the music they’d discovered on FM radio while growing up in suburban California in the 1970s; a heady mix of The Beatles, the Beach Boys, Cheap Trick, ELO, 10cc, Fleetwood Mac, Wings and much more besides. They called their band Jellyfish, accurately conveying the sense of something imbued with grace, yet amorphous, alien-looking and fleeting. Over their two albums together they pulled off a musical conjuring act. All at once Jellyfish sounded like a haphazard jumble of ideas rushing together, as well as something entirely coherent. Into their wondrous pop-rock songs they corralled labyrinthine harmonies, soaring string arrangements and melodies as evocative as a Californian sunrise. The best of these sounded like smash hits from the two previous decades that had somehow escaped the collective memory. Their tragedy was that the band surfaced at the point when the music business swam into the darker, gloomier waters of grunge, and Jellyfish were doomed to drift out of time and place. The final song Sturmer and Manning put down together that day in 1994 was fitting, since it was a cover of Nilsson’s surreal ode to psychic trauma, Think About Your Troubles. For all the glories of Jellyfish, it was a band riven by frustration and pain. It broke its two leaders in two and sent one of them fleeing into a self-imposed exile from which he has never returned. Roger Manning first met Andy Sturmer at the end of the 1970s at high school in Pleasanton, a genteel neighbour of San Francisco. The freshman Manning was a happy-go-lucky teen whose uncle had drummed in various psych-rock bands and who had learnt to play piano on a second-hand instrument donated by his grandparents. A year older than Manning, the more diffident Sturmer excelled as both a singer and a drummer, and was a member of the school’s crack jazz band to which Manning aspired. After graduating from high school, Manning left his home town for LA, enrolling at USC to study musical composition and running headlong into the city’s febrile mid-80s music scene. LA was alive to the sounds of post-punk, the Byrds-obsessed Paisley Underground movement and, most prominent of all, glam-metal, which was exploding from the Sunset Strip. But Manning was captivated by an LA band that stood apart: flamboyantly attired pop-rockers Redd Kross. He began auditioning for bands, setting aside his initial intention to become a film composer. Answering a newspaper ad from a teenage guitarist looking for like-minded musicians and who listed his influences as “Bowie, XTC and the Blue Nile”, Manning made contact with Jason Falkner. Handsome and self-assured, Falkner carried himself like a rock star-in-waiting. The pair would meet at Falkner’s parents’ house and, with Manning sat at the Falkner family’s grand piano, play each other the songs they had begun writing..
Manning had stayed in touch with Sturmer, and knew that his friend was teaching himself to write songs as well. Sturmer had decided that being the best drummer in the world wasn’t his top priority any more, and was also learning guitar. He’d hooked up with Beatnik Beatch, a San Francisco band with a manager and a record deal. Initially their drummer, Sturmer was soon sharing vocals and songwriting. When Beatnik Beatch’s keyboard player quit, Sturmer recommended Manning. His brief flirtation with Falkner having come to nothing, Manning embarked on a regular 12-hour round trip between LA and San Francisco to play with Beatnik Beatch. At the same time, he and Sturmer began writing songs together. Lavish compositions, they were poles apart from the earth-bound songs of Beatnik Beatch, and hastened the demise of that band. In 1989 Sturmer and Manning struck out on their own, holing up in San Francisco and assembling a catalogue of songs and working up their blueprint for Jellyfish. One of them would bring a scrap of an idea to the other, and together they would magic it into being as a fully formed song. Back then the songs poured out of them, swooning, aching tunes such as The Man I Used To Be,_ That Is Why_, and a solo Sturmer composition, I Wanna Stay Home, which echoed Paul McCartney at his widest-eyed. The peak of this intoxicating period arrived with The King Is Half-Undressed, a euphoric mini-symphony that ranged across the vivid musical landscape first painted by Lennon, McCartney and Brian Wilson. Manning describes it now as being “the definitive Jellyfish song and all that we strived for as songwriters”, his pride in the band’s work apparent in the quickening flow there is to his words whenever he talks about it. Scouting for other musicians to help them demo the songs, Manning got back in touch with Jason Falkner, who was persuaded by the promise of a major-label deal. Manning – now sporting a head full of dreadlocks – warned him prophetically that he might find Sturmer tough to get along with. 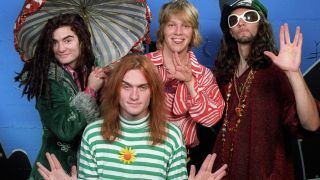 According to Manning, it was the group goal of creating the perfect record that saw Jellyfish through the fractious making of their debut album. Most other American rock bands of the time were either crotch-fixated or navel gazing, but Jellyfish’s perspective seemed positively celestial. Recorded at Schnee Studios in north Hollywood and released into the long, hot summer of 1990, Bellybutton was a seamlessly constructed statement of intent: 10 vibrant songs stuffed full of wit and invention, and further elevated by the assured touch of veteran producer Albhy Galuten, who had recorded the Bee Gees’ Saturday Night Fever. Sharing bass playing with Falkner on Bellybutton was Steve McDonald from Redd Kross. He had been courted by Manning over pizza one afternoon. Manning enthused to McDonald that the album was meant to sound “somewhere between Queen and the Patridge Family”. By that point Bellybutton had appeared to gushing critical acclaim, and MTV was also quick to bestow its patronage on the band. With Manning’s younger brother Chris on bass, Jellyfish set off on a year-long tour that saw them opening for the likes of kindred retro-spirits the Black Crowes and World Party. Their show was striking for the fact that Sturmer stood stage front-and-centre, singing and drumming, and notable for the band replicating the multi-layered sound of Bellybutton. They built up a cult following, especially among their fellow musicians, but the record itself never found a wider audience, and months of close proximity to each other exacerbated existing tensions. Chris Manning quit at the end of the tour for a quieter life as a producer. Falkner, increasingly frustrated at having his own songs ignored by Sturmer and Manning, was next to jump ship. Stripped back down to a duo, Sturmer and Manning collaborated with Ringo Starr on his 1992 album Time Takes Time. They were also invited to write with Brian Wilson, although Manning recalls their single, unproductive session with him as “utterly surreal”. When their thoughts turned to the second Jellyfish album they were determined to make it their masterpiece. Even at a distance of 21 years, Spilt Milk is an overwhelming record, one that almost but never quite buckles under the weight of its makers’ epic ambition. Inspired by the grandiose feel of Steely Dan’s brace of mid-period jazz-rock classics – 1977’s Aja and 1980’s Gaucho – Sturmer and Manning assembled it in painstaking detail and using vintage analogue equipment. The new songs were written in their adopted city of LA between October 1991 and March 1992, Manning trooping to work with Sturmer at his house from 11am to 7pm, six days a week. More months were spent in the studio constructing this vast musical edifice, rendered by massed choirs and with strings, brass, flute, banjo, wind chimes, harpsichord and more. Spilt Milk ran a gamut from driving pop-rockers such as The Ghost At Number One to tremulous ballads to a baroque circus show tune Brighter Day. The ruin of the album was that it appeared just when grunge was peaking in the US and when no one was waiting for a modern-day Pet Sounds. Charting in the US at No.164 on the Billboard Hot 200 in February 1993, Sturmer and Manning’s labour of love sank without trace. They dutifully toured it with another line-up of backing musicians, but their own relationship had started to unravel. The last thread holding them together snapped when they began work on a proposed third Jellyfish record at the beginning of 1994. It was also clear that their individual musical paths were diverging. Sturmer’s new songs echoed classic singer-songwriters such as Van Morrison and James Taylor. In the immediate aftermath of Jellyfish’s demise, Manning formed the short-lived Imperial Drag, whose solitary album (self-titled), of 1996, sounded like a heavier version of his old band. Since then he’s released a couple of decent solo albums, is currently working on a third and also records and tours as a member of Beck’s backing group. Sturmer got married and retreated to the shadows. For several years he acted as Svengali to Japanese pop duo Puffy AmiYumi. More recently he’s carved out a lucrative career at Disney’s TV network, writing songs for children’s shows such as Ben 10 and Teen Titans. He’s been otherwise elusive. That it wasn’t possible to track him down for this piece is hardly surprising, since he hasn’t given an interview in 20 years. Even those who have worked with him, such as fellow songwriter Mike Viola with whom he collaborated in LEO, a one-off homage to ELO, confess that he left them with no contact details. After Jellyfish, Jason Falkner went on to make his own solo records and undertake a run of steady session gigs. He last saw Sturmer in 2004. At the time, he was at Ocean Way Studios in LA and recording with Paul McCartney. Manning thinks it’s possible that he and Sturmer will get back in touch with each other at some point, but dismisses the notion they will ever again write songs together. Instead the 22 near-perfect examples of the form spread across Bellybutton and Spilt Milk will remain their lasting legacy. Want more 90s power-pop? Here’s our Six Of The Best.